Throughout the history of Chicago blues, the intensely competitive local club scene has served as a proving ground, where only the best musicians rise to the top. Iconic blues artists from Muddy Waters to Howlin’ Wolf to Koko Taylor to Hound Dog Taylor to Luther Allison all paid their dues in the Chicago blues bars before making their mark on the world. The same holds true today, as newcomers look to living legends like Buddy Guy, Eddy Clearwater and Lil’ Ed Williams for inspiration in taking their music from Chicago to fans across the globe. 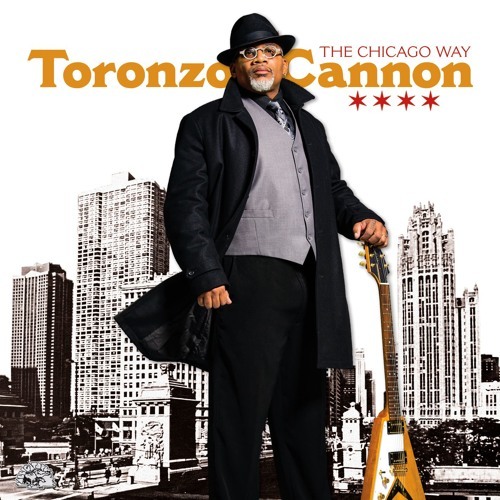 Now, Chicago-born-and-raised blues guitarist /vocalist/ songwriter Toronzo Cannon is ready to write his own story as he claims his place as one of the city’s most popular and innovative blues musicians. Cannon’s unofficial launch from local hero to national star took place on June 13, 2015 at the world-renowned Chicago Blues Festival, where he performed as a festival headliner for the massive crowd. After announcing that he had just signed with Alligator Records, he delivered a riveting set, instantly earning tens of thousands of new fans. Of the performance, The Chicago Tribune said, “Cannon made the most of his opportunity as a festival headliner to win over a new audience.” The Chicago Way is the Alligator debut by the electrifying Windy City bluesman, produced by Cannon along with label president Bruce Iglauer. The album, featuring nothing but Cannon originals, is powered by his blistering guitar and soul-baring vocals. His songwriting is inspired by his deep, homegrown Chicago roots, his years observing the public while working as a city bus driver on the West Side, and his own battles and triumphs. From searing blues anthems to swinging shuffles to soulful ballads to roof-raising rockers, the songs tell timeless stories of common experiences in uncommon ways. “I’ve never worked harder on my writing,” Cannon says. “I challenged myself at every step, writing each song to connect with someone in my audience. I try to write songs that will be both up-to-the-minute and timeless.” He writes about shared experiences with a keen eye for detail. “Blues is truth-telling music,” he says, “and I want my audience to relate to my stories." As a singer, his impassioned vocals add muscle and personality to his already potent songs. With The Chicago Way, Cannon knows more and more people will be hearing his message: the future of Chicago blues is in good hands.